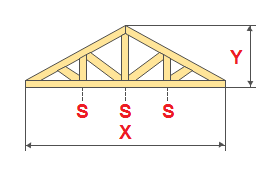 Wooden Rafter frame consists of elements that compose a rigid triangular structure. Recommended height wooden farm-not less than 20 per cent of the length of the passage. The program calculates the required amount of materials will show drawings of farms and the necessary dimensions.